February was a good month for Oxnard employment. The State of California Employment Development Department reported that the unemployment rate in Oxnard fell from 5.4% in January to 4.7% in February, mainly due to 500 new jobs being reported for the month for a total of 96,900 in the City – the highest in Ventura County. The unemployment rate in Ventura County was 4.0 percent in February 2019, down from a revised 4.4 percent in January 2019, and unchanged from the year-ago estimate of 4.0 percent. This compares with an unadjusted unemployment rate of 4.4 percent for California and 4.1 percent for the nation during the same period. According to the California Employment Development Department, the Oxnard preliminary January 2019 unemployment rate ticked up 0.3% to 5.4%. The unemployment rate rose three-tenths of one percent (0.3%), mainly due to unemployment increasing by 200 jobs in Oxnard. The City has a total of 96,400 who are employed – continuing the trend of being the highest in Ventura County. 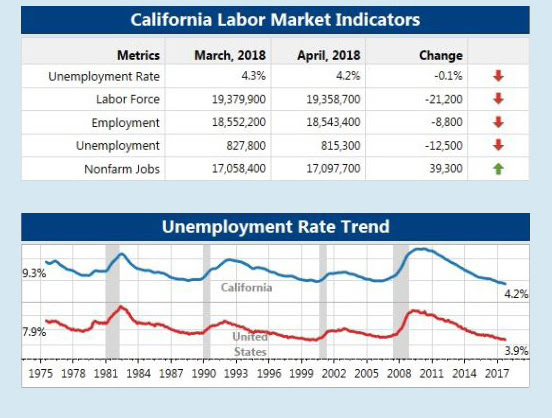 The unemployment rate in the Ventura County was 4.4 percent in January 2019, up from a revised 3.7 percent in December 2018, and above the year-ago estimate of 4.3 percent. This compares with an unadjusted unemployment rate of 4.8 percent for California and 4.5 percent for the nation during the same period. According to the California Employment Development Department, the Oxnard preliminary December 2018 unemployment rate ticked up .1% to 5.1%. Although the unemployment rate rose a tenth of one percent (0.1%), employment increased by 200 jobs in Oxnard. The City has a total of 97,800 who are employed – the highest in Ventura County. The unemployment rate in Ventura County was 3.8 percent in December 2018, up from a revised 3.7 percent in November 2018, and below the year-ago estimate of 4.0 percent. This compares with an unadjusted unemployment rate of 4.1 percent for California and 3.7 percent for the nation during the same period. According to the California Employment Development Department, the Oxnard preliminary November 2018 unemployment rate ticked up .1% to 5.0%. Although the unemployment rate rose a tenth of a percent, employment increased by 500 jobs in Oxnard. The City has a total of 97,600 who are employed – the highest in Ventura County. The unemployment rate in the Ventura County was 3.7 percent in November 2018, unchanged from a revised 3.7 percent in October 2018, and below the year-ago estimate of 4.1 percent. This compares with an unadjusted unemployment rate of 3.9 percent for California and 3.5 percent for the nation during the same period. According to the California Employment Development Department, the Oxnard preliminary October 2018 unemployment rate is 4.9%. The City has a total of 102,000 in the labor force with 97,100 who are employed – the highest numbers in Ventura County. The unemployment rate in the Ventura County was 3.7 percent in October 2018, unchanged from a revised 3.7 percent in September 2018, and below the year-ago estimate of 4.1 percent. This compares with an unadjusted unemployment rate of 4.0 percent for California and 3.5 percent for the nation during the same period. The California Labor Market Information Division released its September 2018 report earlier today, showing an improvement in the Ventura County unemployment rate, from 3.9% in August to 3.7% in September, driven by the addition of 5,400 jobs in Farm and 1,900 jobs in education. On the downside, looking at all other Non-farm private sectors, Ventura County lost 2,200 jobs in September. Ventura County’s current unemployment rate, at 3.7%, places in the middle of the pack among California’s 58 counties, at 27th, down five slots from a month ago, at 22nd. While extraordinarily low, the County lags just behind the U.S. as a whole, at 3.6% unadjusted, and just ahead of California, at 3.9%. 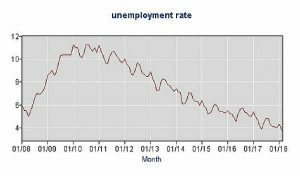 The California Labor Market report revealed that Ventura County’s August 2018 unemployment rate of 3.9% was unchanged from a revised 3.9% in July of 2018. A total of 3,600 non-farm jobs were gained in August of 2018; however, 200 jobs were added, for a net gain of 3,400 jobs. 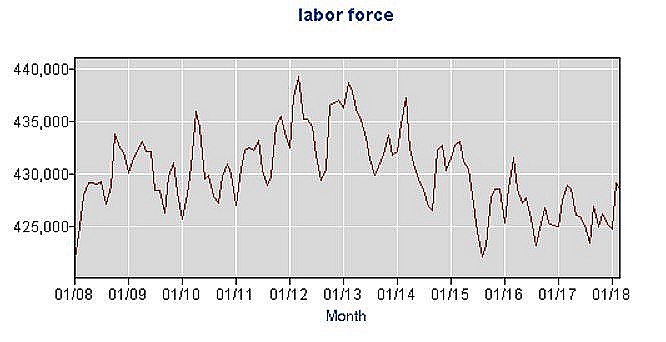 The loss in jobs includes 100 in trade, transportation and utilities and 100 in services. The gain in jobs includes 900 in government, 900 in educational and health services, 700 in professional and business services, 400 in construction, 300 in leisure and hospitality, 200 in manufacturing, and 200 in financial services. The unemployment rate in Ventura County was 3.9 percent in July 2018, down from a revised 4.0 percent in June 2018, and below the year-ago estimate of 4.8 percent. This compares with an unadjusted unemployment rate of 4.4 percent for California and 4.1 percent for the nation during the same period. The Community & Economic Development Department is proud to announce the City’s 26th annual Heritage Square Summer Concert Series 2018! With the release of the latest jobs numbers from the California Labor Market Information Division, it was reported that the unemployment rate in the Ventura County was 4.0 percent in June 2018, up from a revised 3.2 percent in May 2018, and below the year-ago estimate of 4.4 percent. This compares with an unadjusted unemployment rate of 4.5 percent for California and 4.2 percent for the nation during the same period. While our unemployment number jumped up to 4.0 percent, from 3.1 percent in May, Ventura County is still outpacing both the state and the nation as a whole. Our current unemployment rate of 4.0% places us at 18th among California’s 58 counties, down from 14th a month ago. 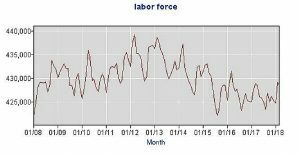 Things continue to look well with the employment picture in Ventura County during the month of May, outpacing both the state of California and the nation. The unemployment rate in Ventura County was 3.1 percent in May 2018, down from a revised 3.3 percent in April 2018, and below the year-ago estimate of 3.9 percent. This compares with an unadjusted unemployment rate of 3.7 percent for California and 3.6 percent for the nation during the same period. With May’s reported unemployment numbers, Ventura County has now set all-time lows in unemployment three months in a row. The federal tax bill passed at the end of December 2017 allows the Governor to designate census tracts as Opportunity Zones. Investments made by individuals through special funds in these zones would be allowed to defer or eliminate federal taxes on capital gains. The Governor can designate up to 25 percent of census tracts that either have poverty rates of at least 20 percent or median family incomes of no more than 80 percent of statewide or metropolitan area family income. There are 3,516 census tracts in 54 California counties that would qualify under one or both of the mandatory criteria, allowing the Governor to designate up to 879 tracts. As census tracts are designed to capture geographic areas of around 4,000 people, more than 3 million Californians would potentially be located in one of these areas. The U.S. Department of the Treasury has certified California’s nominated eligible census tracts and has designated all 879 nominated tracts as Qualified Opportunity Zones under Internal Revenue Code (IRC) Section 1400Z-1(b)(1)(B). 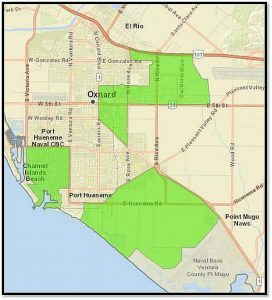 WHAT DOES THIS MEAN FOR OXNARD? The program is intended to attract long-term investments to disadvantaged areas, as measured by poverty and median income. U.S. investors currently hold trillions of dollars in unrealized capital gains in stocks and mutual funds alone— a significant untapped resource for economic development. Opportunity Funds provide investors the chance to put that money to work rebuilding the nation’s left-behind communities. The fund model will enable a broad array of investors to pool their resources in Opportunity Zones, increasing the scale of investments going to underserved areas, including areas within Oxnard. • Rose Park, located within the boundaries of 101 Freeway (North); Oxnard City Limit (East); Fifth St. (South); Rose Ave. (West); Camino Del Sol (North); Graves Ave. (West); E. Gonzales Rd. (South); N. Rose Ave. (East). • Colonia, located within the boundaries of Juanita Ave. (East); E. Third St. (South); S. Oxnard Blvd. (West); E. Colonia Rd. (North). • 5 Points Northeast Census Tract, located within the boundaries of Rose Ave. (East); Oxnard Blvd. (West and South); Colonia Rd. (North); Juanita Ave. (East); W. Third St. (South). The unemployment rate in Ventura County was 3.2 percent in April 2018, down from a revised 3.6 percent in March 2018, and below the year-ago estimate of 4.2 percent. This compares with an unadjusted unemployment rate of 3.8 percent for California and 3.7 percent for the nation during the same period. This latest report signals that the Oxnard-Thousand Oaks-Ventura Metropolitan Statistical Area’s job market is improving. With our unemployment rate at 3.2 percent, Ventura County ranks 14th place among California’s 58 counties. On the state level, California’s unemployment rate fell to 4.2 percent in April – a new record low in a series dating back to the beginning of 1976 – and the state’s employers added 39,300 nonfarm payroll jobs, according to data released today by the California Employment Development Department (EDD) from two surveys. California has also now gained a total of 2,908,100 jobs since the economic expansion began in February 2010. 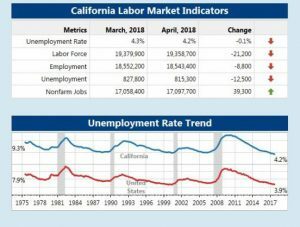 The California Labor Market report revealed that Ventura County’s March 2018 unemployment rate of 3.6 % was down from a revised 4.0% in January 2018. 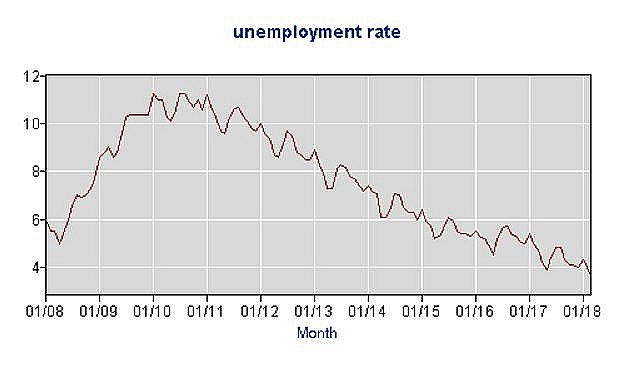 The 3.6% unemployment was the lowest since 2000. A total of 1,200 non-farm jobs were added in March 2018, however; 100 jobs were lost, for a net gain of 1,100 jobs. The loss in jobs includes 100 in construction. The gain in jobs includes 300 in professional and business services, 200 in leisure and hospitality, 200 in financial services, 200 in trade, transportation and utilities, 100 in manufacturing, 100 in educational and health services, and 100 in government.